In the first part of “SEO for Beginners,” I discussed just the basics of keyword research and the difference between long-tail and short-tail keywords. One of the points I tried to hammer home is that you need to think like your potential site visitors. This week we’re going to explore this train of thought in more detail by explaining how and why geo-targeting can drastically improve your SEO. Google, the great “glocalizier,” has been placing more and more emphasis on searches returning results for local companies relative to the “searchers” physical location. This isn’t because Google has a love of small businesses, but because it wants to increase the relevancy of its search results. Think about it this way, someone located in Austin, Texas searching for “burgers” doesn’t want to find links to a burger joint in France. This is why geo-targeted keywords are so important, as they form an integral part of your relevance rich, long-tail keywords. Another benefit of these search terms is that, for the most part, they are cheap and easy to get ranked for. As you might have guessed from the name, geo-targeted keywords are ones that have some sort of geographical location attached to them. Locations differ in scale, from neighborhoods and street names all the way up to countries and continents. So what is the right scale for your business or website? It comes down to two factors: the type of business you run, and also setting realistic goals that avoid wasting money on unattainable keywords. A fledgling real estate office located in Spain shouldn’t immediately put all their effort into ranking for “Spanish real estate.” But after doing well and expanding their business, more effort and time can be put towards ranking for larger scale keywords. 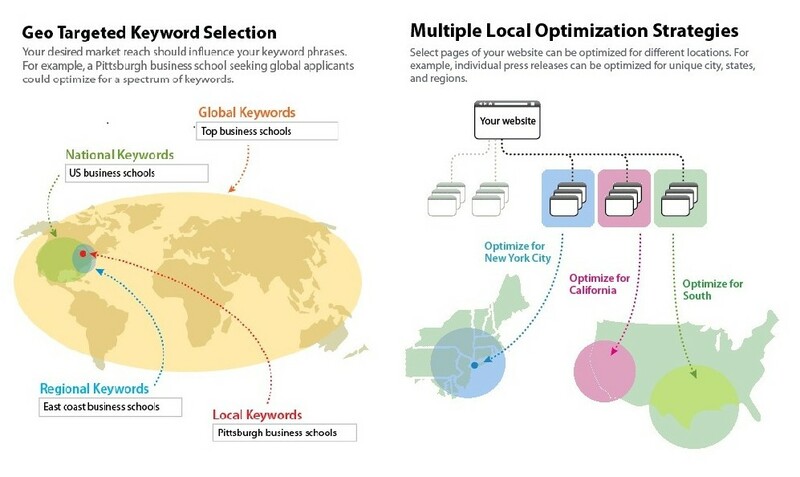 How Should Geo-Targeted Keywords Differ for Different Types of Businesses? What type of business or website you run should heavily influence about your geo-targeting strategy to avoid wasting cash and to maximize returns. Let’s start with your typical local brick & mortar small business. A business whose main market is the local community should aim at local-specific terms such as “Austin Texas Burger” or “Best Austin Burger.” Again, the key is to stay relevant. For example, a small florist business in Houston would want to rank for Houston-targeted keywords (or even the particular part of the city they’re located, e.g. Downtown, The Heights, Bellaire, etc.) because a florist in Houston can’t really do business with people requesting flowers New York. Local business should always have their address and phone number listed on their website. Not only does this help their customers find your location while on your site, but a local phone number and address will help your rankings in Google. I’d recommend putting what you do and where you do it in your URL, your header, your meta tags, and the aforementioned meta description. Link your “contact us” page to Google maps. 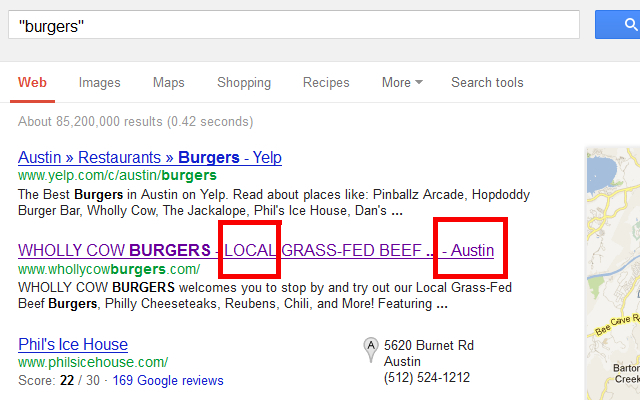 One option is to embed Google maps into your site like the Austin based Mexican joint, Polvos. If the embedded map doesn’t fit into your aesthetic of your site, a link to the Google map will do. Austin’s Barley Swine does this particularly well. Another great way to get the search engines to recognize your location is to incorporate a schema location markup into the code of your site. Head on over to Schema.org, input your business’ information and simply follow the directions of this searchenginewatch.com guide. But what about local businesses that have larger, potentially international target markets? You may notice that large, multinational companies will use separate landing pages — or even different domains — for different territories. This is just a scaled up and slightly more complex version of the strategies I mentioned in the video above. Who knows, your company might just get to that stage someday. Online businesses have a much larger market, due to the ubiquity of the web. An online retailer’s market could be as large the entire continental United States. At first glance, this could seem incompatible with the specificity and relevance offered by geo-targeted keywords. But, as Digital Marketing Xperts points out, by analyzing the locations of your existing customers, you can tailor fit your keywords to the people buying your product. If you’re selling high quality furniture, you may want to target the wealthier areas of a city. Online retailers might find it hard to use tailor-fitted, geo-targeted keywords in the actual content of their website, but they work especially well in Google’s sponsored ads. In the next part of this essay, I’ll discuss the different type of keywords for different forms of online media; such as Press releases, blog posts, and static web-pages. For any questions on geo-targeting keywords or anything else SEO, jump over to this ChooseWhat forum post and I (or any other of our SEO experts) will be happy to answer your questions.